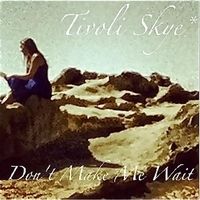 Hauntingly Great Award Winning song by Tivoli Skye's Original song " Don't Make me Wait " Incitetful lyrics, deep & thoughtful, creative production. Music produced by Mark Bader, Mix by Ron Hitchcock Gramy award winning Producer. Tivoli Skye is a multi faceted artist/performer/singer/songwriter, looking to have her music featured on film, tv and commercials. She is a multiple award winning artist This music is heartfelt Alternative style music, Tivoli Skye speaks for many with her inciteful style. She ahs been aawarded many prestigious awards for not only her artistry but for her dedication to charities especialllly those thta promote success in dealing with bullying. As a survivor of Bullying this has been a subject close to her heart, winning her accolades at Miss NY pageant , Police dept, and mental wellness events featured guest with Senators, and celebrities who also use their voice to help further the causes. Please check her out on all google references/ websites. Tivoli is resently #2 n Reverbnation -and spent a year and a half at #1 previously. Soon her new album and videos will be out. Feel free to become her friend on her own websites as well as Facebook, Youtube sites, Google +, raterbug, strs2come,dc coast to coast, TD1 in Scotland w/ Donald Strachan. Her new videos will be out soon for other new songs for upcoming album " Day Dreamer" " Don't Make me Wait "is a teaser single . Enjoy !